One of my favourite things about climbing with Pete is that he loves a silly challenge. It doesn’t matter whether it’s painful, tiring, embarrassing or just ridiculous – he’s up for it. I’ve climbed over 500 routes in a day with him, lead Master’s Edge dressed as a transvestite and various animals and also completed the Staffordshire Nose Challenge. 2. Both members of the team must climb each route cleanly and in any order. 3. The clock starts at the first route and finishes when the seconder tops out the last route. 4. Beat Andi T’s time!!! Over the last few years, the challenge has morphed from one where the aim is simply to complete it in 24hrs (it’s actually blooming’ hard) to trying to better the fastest time it’s been done in. Last year the Staffordshire Hotshots (Andi Turner and Pete Bridgwood) broke mine and Pete’s time to set a new record at 8hrs 41mins. 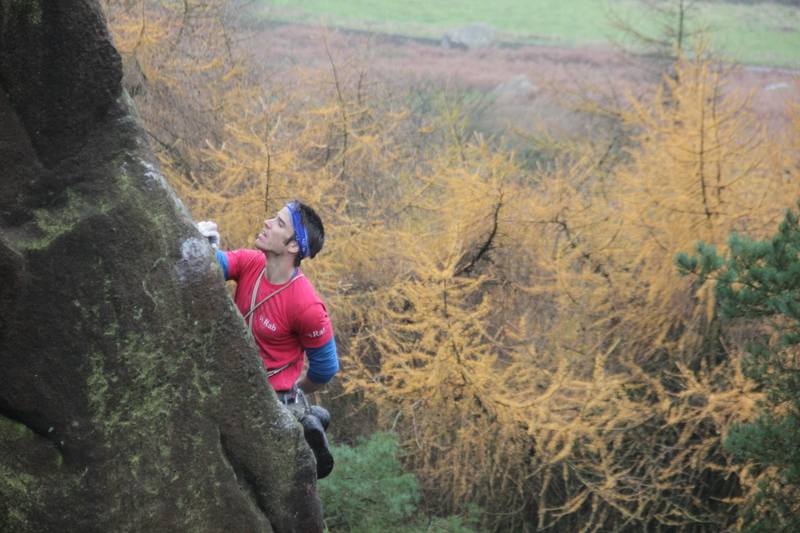 They’d prepared well and got some really good section times in, especially at the Roaches. With the record broken, Pete and I started to get really psyched. It was just like Hans Florine and Dean Potter on the Yosemite Nose…. times were coming down and non-serious rivalries developed! Last week – after a preparation day the week before – Pete and I went for the record. We were pumped up and amped to the max. I’d even persuaded Pete that stopping for lunch was NOT an option. As we waited at the base for our start time, we felt apprehensive as both of us had a developed a need for frequent toilet stops. I’d eaten a month’s worth of Clif Bars at the Kendal Film Fest the day before and I was paying the price. Guy Van Greuning came out to capture the day’s action on film (by the look of his face at the start I think he couldn’t believe that two climbers could be such idiots and still contemplate this day out!). The day actually went very badly considering all things. The main problem was that only one route on the whole day was actually dry, due to a claggy mist that enveloped all three crags and later rain. Fortunately one of the first routes that we had to do was the dry one, so somehow Pete and I focussed on the positivity of this and pushed on. After an hour or so, it started to rain and things got fairly critical. Pete’s lead of Dorothy’s Dilemma (very bold E1 5b) was “scarier than Meshuga” in his words and I very nearly fell of seconding it as I tried to pull on holds that resembled bars of wet soap. By the time we’d reached Hencloud and 16+ routes were under our belts, we had entered the zone of no return. We were screwed and we knew it. Our trousers and tops were soaking wet, our shoes were drenched and chalk didn’t seem to do very much except colour the rock. On our preparation day we’d been careful about cleaning our shoes, making sure there were no damp spots on the rubber and coiling the rope carefully. Now, at 1pm on Hencloud we were soloing Main Crack with feet that were so wet that any drying was hopeless. The water seemed to emanate from within! Fortunately Pete and I had a secret weapon. Neither of us ever admit to the other person that we should probably give up. We know that as long as the fateful words are not spoken then failure isn’t an option until literally someone can’t drag themselves up another single move. That did nearly happen at Ramshaw though. I was seconding Masochism (how the hell is that HVS???!!) and reached a point of total exhaustion. I was smoked. I couldn’t breathe and my arms wouldn’t bend. I’d gone all-body anaerobic and Pete just sat above shouting words that made me feel like a hero. I felt like a deadman walking. Deadman climbing? Somehow his unrealistically optimistic words booted me in the arse and I crawled upwards. I don’t know how. It was so close I felt like I’d just topped out on Century Crack again. In fact I think I might have tried harder on Masochism?! Just half an hour later Pete lead Ramshaw crack in soaking wet conditions and I joined him at the top, slithering into a pile of Tom-shaped clothes. Guy was screaming, Pete was screaming and we were over the moon to get a new record time of 5 hrs and 53 mins. What a day and so happy to have had those two guys to have enjoyed it with. Think I might do a bit more of this! Commitment is doing the thing you said you would do, long after the mood you said it in has left you. Good effort! Well done. 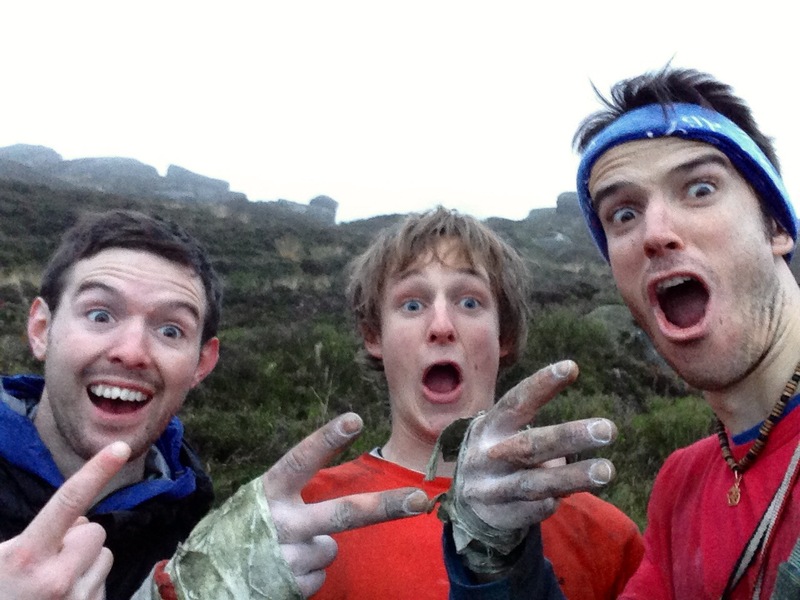 awesome guys – true grit! A challenge is nothing if it’s easy and doesn’t push you to the very max and then a whole lot more! Just back from Patagonia and our own particular challenge on The Wall of Paine. Like I often say – you can always do more than you think you can. How true are those words?! And what a priviledge to be able to find out how far you can push yourself. Personally I think its a priviledge less than 0.01% of humanity get to experience. Nice one people. 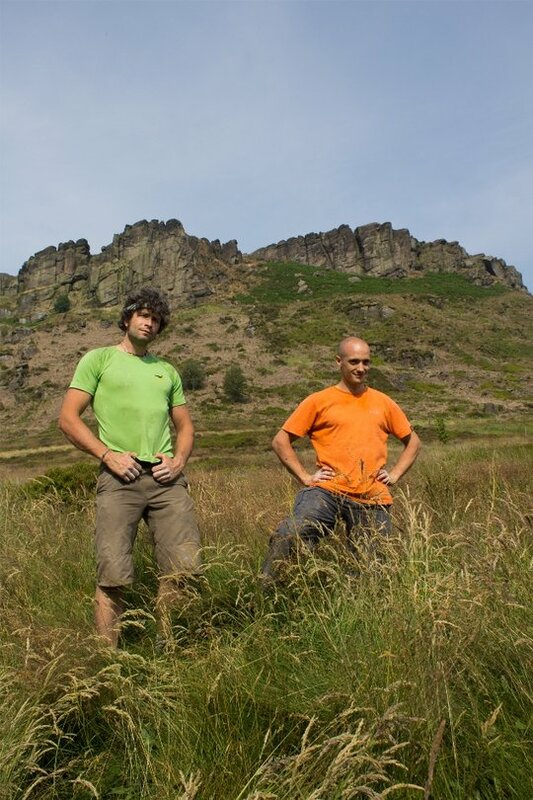 Thanks Jerrry… It might be gritty on Ramshaw but never ever as windy as Patagonia!! And yes you’re absolutely right that it’s an amazing thing to push near to your limits. You learn a lot about yourself. Awesome! There are some good link ups possible in Snowdonia. I’m considering setting the slowest time … I started last year! Rapid climbing guys !! Fair record to beat lads!